There is a certain excitement when you lie under the starlit sky and watch the moon play hide and seek behind the clouds. There is utmost serenity all around and the only noises to be heard is that of the wind blowing and the occasional hooting of an owl. It is an absolute bliss for those who enjoy to camp as these sights and sounds will stay with you for a lifetime. South India has many places where you can go camping, with each place having its own speciality. Camping is one of the adventure travel activities that travellers look forward to. The popular activity provides getaways that are cut off from civilisation and travellers can live amidst the beauty of nature. 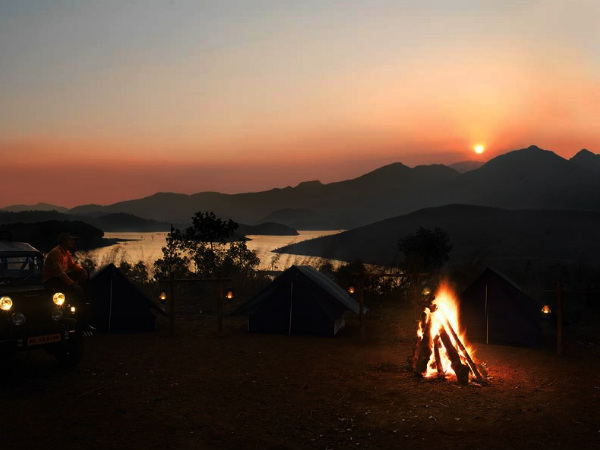 Here is a small guide to the places in South India where you can experience the joy and thrill of camping. Kodachadri in Karnataka is located at an elevation of 1,343 mt above the sea level and is a popular camping destination among tourists. It is known to house the famous Mookambika Temple and campers have a great time trekking through the forest. It is a picturesque place and is known to be teeming with wildlife. It is an ideal place to head to if you are interested in adventure and thrill. Mudumalai is the meeting point of three states namely; Karnataka, Tamil Nadu and Kerala. This forest region is a camper's delight as you get to trek through the hills and indulge in various activities here. Also, it has a wildlife sanctuary where you can head to catch a glimpse of its rich wildlife. The scenic beauty, its various sightseeing spots and the opportunity to indulge in activities makes this a camper's paradise. The hill town of Yelagiri in Tamil Nadu is a backpacker's paradise as it has many things to offer to its visitors. The dense green forest and the picturesque locales are the perfect place to head for a camping trip. Also, there are activities such as paragliding and rock climbing here that is sure to set your adrenaline pumping. The dense forests of Dubare is famous for its elephant camps where tourists can get up close with these gentle beasts. It is a perfect place to head to with family, especially if you have small kids as they would love it here. Tourists coming here can learn more about the nature of these animals and also take a ride on them. The Coringa mangrove forests in the Godavari delta is a popular camping site, where campers head to enjoy the beauty of nature. You can head to the wildlife sanctuary that is located here as well. The nature trails here allow you to catch a glimpse of varied species of reptiles or head to the river for boating and other activities. Coorg is a popular tourist destination in Karnataka and is crowded by tourists around the year thanks to its pleasant climate. It is also referred to as the 'Scotland of India' and is known to be a camper's heaven as they can indulge in various adventure activities here. Tourists come here from far and wide to be a part of the camp and enjoy the activities such as trekking, rock climbing, cycling and more. Another incredible escapade for campers is the hilly terrians of Munnar. The dense forests adds to the beauty of this place and tourists come here to be lost amidst the beauty of nature. This picturesque spot in Kerala is thronged by nature lovers and photographers. You can head to the hills for trekking or simply enjoy the scenic views around you. There is some magic about the pristine beauty of Wayanad that attracts tourists. Located in the Western Ghats it offers campers with the opportunity to go trekking and cycling across hilly terrains. It is a perfect place to head to with friends during the weekends and explore the vast beauty of nature.